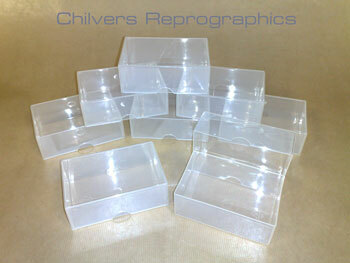 Clear Poly-Propylene boxes for Business Cards, membership cards, ID cards etc. These business card boxes have exceptional clarity and items inside can easily be viewed through the box. Our business card boxes are 100% recyclable. Each box holds approximately 125-150 cards. Our business card boxes are the ideal way to present finished printed cards. These clear business card boxes have a million usages aswell as business cards the list is endless, ideal as storage boxes for screws, nails, pins, paper clips, fittings etc. Dimensions 95 x 60 x 35 mm high closed approx 55mm max capacity. Key Terms: Craft Boxes, Clear Plastic Business card Boxes. X1000 Boxes - £140.00 / 14p per box with FREE next day delivery (to UK Mainland).